"Weight will decrease slightly at night when all bees are in ...". Shouldn't that read INCREASE? Or is the weight of the extra bees at night not enough to counter balance the amount of honey they consume? @Anke yes, indeed in my blog http://martenschoonman.blogspot.nl/2016/03/digital-beehive-monitoring.html I mention that. I think it's easiest understood with a graph. 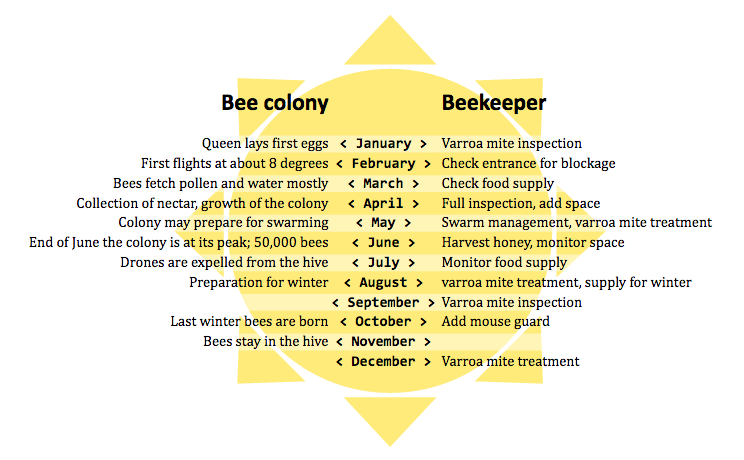 See for example slide 5 of 'Monitoring Hive Weight, Temperature, and Sound: The Inside Info and What it Might Mean' by Bryan Hains [http://hivetool.net/hive_reports/hivetool_2Apr14.ppt]. The foraging bees return to the hive at dusk and stay in the hive overnight. This represents a weight increase indeed, but only just before dark. It's a small amount, compared to the weight in- and decrease of the liquids; water and nectar is brought in (on a favourable day) and that causes the weight to sharply increase. The weight at night decreases because the (house)bees stay active and evaporate water from the nectar to produce honey.